Last updated 02 October 2018 . By Georgia Evans. Some of you may remember the 90’s (I was born in ‘96) when The Alphabet Bar was a hub for media types and creative crowds on Soho’s Beak Street, with notoriously rude waiting staff. Well, after five years of closure, the bar has reopened in a new location, with a fresh breed of customers and a new set of excellent staff to match. We thought we’d head to Alphabet in Angel, and check out what the revamp had to offer us millennial types. Soundtracked by a playlist of some of the coolest underground bands at the moment, Bodega and The Lemon Twigs among others, Alphabet has a really chill feel to it. Think Brooklyn-style eatery with a bar at the front and an open kitchen, painted brickwork and metal beams. The hanging baskets make for a nice burst of life, while the large skylight at the back of the restaurant floods the dining space with natural light in the day and the large neon sign adds a cool edge in the evening. We were seated opposite the bar and kitchen, right in front of the action, and we could see how attentive the kitchen was to detail. This same level of dedication was then passed onto the diners themselves, as the waiting staff and bartenders regularly checked in, chatted and joked with all of their guests. The restaurant opens up to this gorgeous dining area. Happy hour was in full swing, with all their gorgeous cocktails reduced to only £7 each. After talking about the interesting back story to our preferred spirits with the barman, we started with a Warning Sign (£9), a really light refresher with a tang from the pickled blueberries and rhubarb gin, and a Smoke Signal (£10), which was then presented to us in a bell jar, and released an enticing citrus aroma once opened. They were both so good that we knew another round would soon follow, and it did. I would definitely recommend a Break the Seal (£9.50), for an instant zingy hit, or Alphabet’s twist on an espresso martini, the Oreo Iced Coffee (£10), served in a little take away cup with Oreos alongside it, which I thought was very cute. 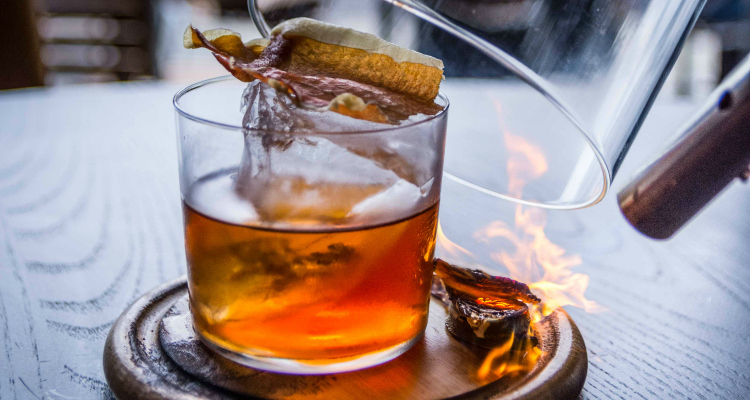 An example of the impeccable presentation of their cocktails, the Smoke Signal. Of course, it’s not just lovely drinks they were serving. The revamp included a whole new menu courtesy of head chef Yaz Khadiri, whose Mediterranean-inspired small plates pack just as much punch as the cocktails. The authentic flavours really shine through in dishes such as the wild mushroom tagine (£12), a rich and earthy combination of mushroom, peppers, lentils and gremolata with melting sweet potato, and the fennel and courgette fritters (£7), while the beetroot tahini and black garlic dip (£5.50) had buckwheat popcorn and flatbreads to accompany, which added a nice crunch. 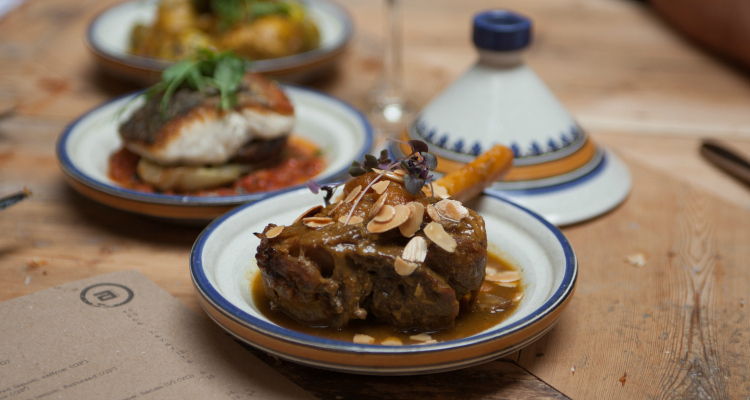 Now, their specialty is the slow-cooked lamb (£15), which is worth a mention as it fell off the bone with such breath-taking finesse that, as a vegan, it was almost, almost, enough to turn me back to eating meat again. The stunning lamb that almost turned this vegan full carnivore again. Alphabet's reinvention is a much-welcomed addition to the bustling food and drink scene in Angel, with gorgeous cocktails that are made with care, not just because they’re following a recipe. 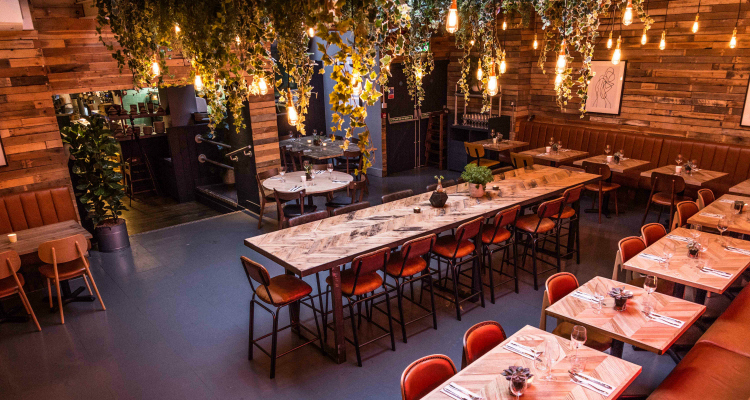 The addition of a new food menu means it’s a stylish refuge for groups of cool North Londoners to share delicious dishes and hang out while enjoying the happy hour. Our waiter joked he’d lock us in if we didn’t finish our meal, and to be honest, it wouldn’t have been a bad thing because I would’ve had the bar to myself all night long.